The Art of the Party by culinary guru Kay Plunkett-Hoge contains a range of classic recipes that Kay has literally perfected. 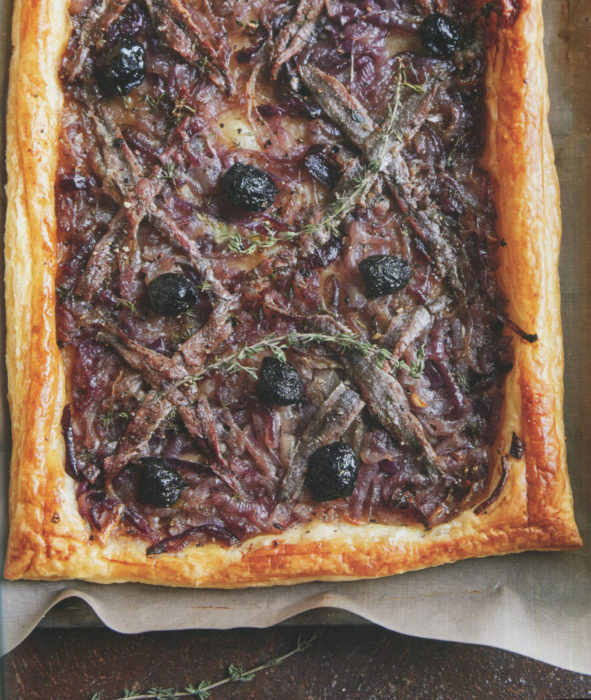 From the south of France, this combination of onions, garlic, thyme, anchovy, and olives is a head-rocking testament to Provence. Why visit Provence? The lavender. And the food. This food, this dish. This can be an appetizer or, paired with a salad, it’s a hearty main course. Chilled white wine, of course. The tang of olive and anchovy is an undisputed culinary winner. If you have never enjoyed this dish, you really should. If you add capers, that would not be a sin. It would be Mediterranean. Heat the oil and butter in a large saucepan. Add the onions and turn the heat down low. Let the onions cook slowly, stirring and turning every now and then, until they are deep golden and soft – 20-30 minutes. Add the sugar and stir through, then add the garlic and the leaves of 4 of the thyme sprigs and cook for a further few minutes. You want the onions to be meltingly tender. Season with a little salt and plenty of pepper and leave to cool. Preheat the oven to 200°C (400°F), Gas Mark 6, and line a baking sheet with nonstick baking paper. Unroll the puff pastry sheet and place on the lined baking sheet. Using a sharp knife, make a cut (but not all the way through) along the edges of the pastry, about 2cm (% inch) in from the edge. This will give the pie a nice crusty raised edge. Prick the inside of the oblong with a fork. Gently pile the cooked onion mixture on to the pastry, keeping within the cut lines. Criss-cross the anchovies in a diamond pattern all over the onions. Place an olive in the middle of each diamond. Scatter with the remaining thyme sprigs. Season lightly. Brush the pastry edges with the beaten egg, then bake for 20-30 minutes until the pastry is risen and golden brown. Serve warm, cut into squares.